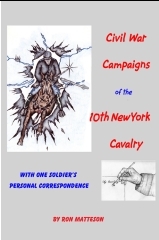 I recently published a Civil War book, Civil War Campaigns of the 10th New York Cavalry, which was inspired by a collection of letters we have in the family about one of the soldiers in that unit. The book is what I call my “3rd Edition” of a previous two books of letters, which I titled “Justus in the Civil War”. I transcribed these letters between Justus Grant Matteson, my great-grandfather, and his future spouse Mary Louise Hatch, and had a few copies printed for members of the family. In studying about some of the events in which he had been involved, I noted references to Noble Preston’s History of the Tenth Regiment New York Volunteer Cavalry, published originally in 1892, and was able to get a reprint of his book from the Higginson Book Company in Salem, MA. My book is the result of reprinting the letters between Justus and Mary, with information added from Preston and other sources about the various activities in which he was engaged during the Civil War. The 10th New York Cavalry was engaged in many critical operations with the rest of the Army of the Potomac, fighting mostly in northern Virginia. Some of the letters discuss visits made to other Mattesons in nearby units, with whom he was related in some way. This project was very educational for me. History was not my best subject in high school, but I had some interest in the Civil War due to Justus Matteson’s participation. In writing this book I learned a lot about the Civil War, especially the part of it that was carried out in Virginia, since Justus spent his entire time in the 10th New York Volunteer Cavalry in Virginia (excluding the expedition north in 1863 during the Gettysburg campaign and the momentous Battle of Gettysburg). I reviewed the battles of the Civil War in which Justus participated, and took trips to Virginia to see many of the areas in which he fought. I found this project to be extremely interesting and enjoyed it, but the joy was tempered greatly by the fact that almost one million fine young American men were casualties of this war. Since Justus was in the cavalry he rode his horse during marches and some battles, giving him much more mobility than infantry soldiers. (He was raised on a farm, and hence was no stranger to the riding and caring of horses.) The infantry, on the other hand, walked everywhere they went and fought from fairly stagnant positions on the battlefields. The activities of the armies of both sides were greatly constrained by geography and weather. They rarely did much during the two or three winter months of each of the years 1862-1865, except perhaps an occasional cavalry raid. There were railroads, but these were not often used for troop movements, and each side concentrated on destroying the railroads used by the opposite side. The rivers of Virginia greatly dominated the movements of both the North and the South. The great Rappahannock River was the dividing line between Northern and Southern armies for much of the Civil War. Troop movements of any length involved crossing many small rivers (often called “runs”, as in Bull Run, Mine Run etc.) and usually a few large ones. They used bridges if they existed and the enemy had not destroyed them; fords if these shallow zones existed and even resorted to swimming when required. On maps in this book will be found the Potomac, Rappahannock, Rapidan, Appomattox, Pamunkey, Po, Shenandoah, Occoquan, North and South Anna, James, Chickahominy, and Mattapony. These were just the largest ones. Countless other streams, creeks, and runs added to the difficulty of navigating through Virginia on horse or foot. The waterways had a tremendous part in planning the strategies of the various campaigns. Quite often plans were foiled due to flooding waterways, destroyed bridges, picketing forces on the opposite banks etc. There will be accounts in this book of cavaliers being stranded on the wrong side of a river, large campaigns being aborted due to rain, mud and overflowing rivers etc. In creating this book I have included information from Preston’s book. I have also included several official military reports written by military commanders after important battles and other events. There are tables near the beginning of each chapter giving a list of the events covered in the chapter, their dates, and a reference to their location on maps included in the chapter. There are also short reports on many of the engagements compiled by the National Park Service Civil War Sites Advisory Commission (CWSAC). This commission studied the battles of the Civil War, and selected 384 of the most significant, for each of which they wrote short reports included on the NPS Civil War web pages. I have included 25 of these reports in this book, these being the ones most pertinent to the 10th NY. There are many other web sites containing information about the 10th NY, which are referenced in the appropriate chapters and the Bibliography. Several other books and web sites were used to supplement the information, and are also included in the references at the end of each chapter and the Bibliography at the end of the book. 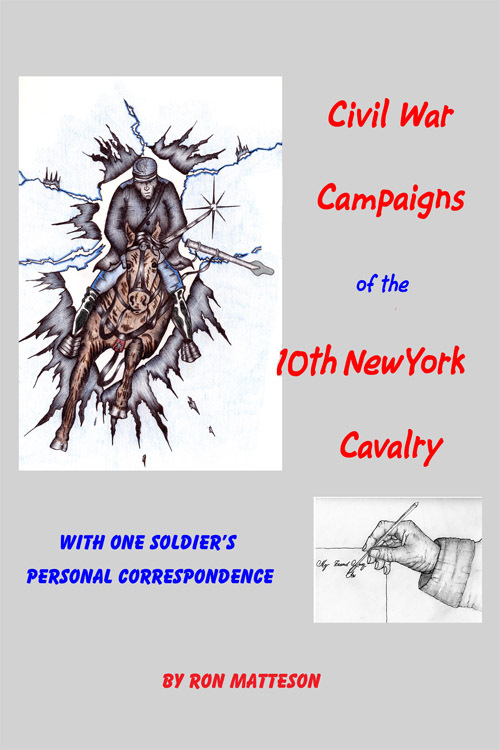 The events, battles, campaigns and engagements involving the 10th New York Cavalry are well-known by Civil War buffs and are exciting to read. Justus Grant Matteson was born on December 21, 1839, making him twenty-two years old when he enlisted with the unit from Solon, New York. His father and mother were Cyrus French Matteson and Sally Baker Matteson. They had one other child, Clarissa Adelia Matteson, called Adelia or Delia in the letters. Justus’s father later married again, to Almira Davis. They had a daughter Thena, born about 1846 in Cortland. Cyrus also married for a third time, to Frances Guile on September 7, 1873 in Grand Rapids, MI. They had one daughter, Athenia, born on July 7, 1878 in Kent, MI. Mary (Mat, Mate, Matie, and Molly, as Justus called her in various letters) and Justus were married on July 4, 1868 and had three children - Frank Leroy Matteson (this author’s grandfather), Maude Bell Matteson and Alta May Matteson. Sometime after their marriage, Justus and Mary moved to Syracuse, NY, where my grandfather, my father Reginald Grant Matteson, and I were all born. In the Justus and Mary letters included in this book the original spelling was retained. Some poor spelling may be due to limited education, some may be due to the desire to get a fast letter off before the next move and some may be due to local colloquialisms. An occasional period or other punctuation has been added for clarity. Question marks, blanks etc. have been used where original writings are indecipherable. Apparently punctuation, like periods at the end of sentences and capitalizations of the first words of sentences, were not used as much in those days. Frequently it is not possible to determine the end of one sentence and the beginning of the next one, except by the context. Note that it is very likely that more than the 60 letters included in this book were exchanged among Justus, Mary and others, which did not survive the war period. In this book there are references to many other sources, listed at the end of each chapter. There are also occasional short insertions and explanatory notes in material from some of these other sources. There are also several maps, tables, figures, and many photos – some old ones of the period and some taken by the author while visiting some of the Civil War sites. Another “Matteson”, grandson Kevin Crandall, helped create the cover artwork on the book. The book is dedicated to all of the descendants of Justus and Mary Matteson in the hope that they will learn more about some of the sacrifices their ancestors have made in keeping our country safe, secure and functioning as the great nation that it is. The Civil War is a major example of individual dedication to duty, in that many extremely smart and dedicated individuals played key roles in military and civilian activities. In fact many military men went on to continue their public service in civilian roles - foreign representatives, elected congressmen at the state and national level etc. On the other hand many stayed in the military, serving in the Western United States as a stabilizing influence until civil authorities gained control. Dr. Matteson has published a textbook on document image processing while serving as a professor of computer engineering at the Rochester Institute of Technology, a practical book about scanning for the small office and home office, and this book, Civil War Campaigns of the 10th New York Cavalry. He has been a student, sailor in the US Navy, officer in the US Army, engineer, researcher, inventor, teacher and author. He is a licensed Professional Engineer in the State of New York, and has been chairman of a local Rochester computer users group and founder of a digital photography and scanning users group. He is a Senior Life member of the Institute of Electrical and Electronic Engineers. He is a member of the Walworth Historical Society in Walworth, NY. He and his wife Juanita are members of Browncroft Community Church in Penfield, NY. This book can be obtained online at Barnes and Noble, Amazon, and Lulu.com. The author’s Civil War website is http://home.roadrunner.com/~nycav/nycav/.